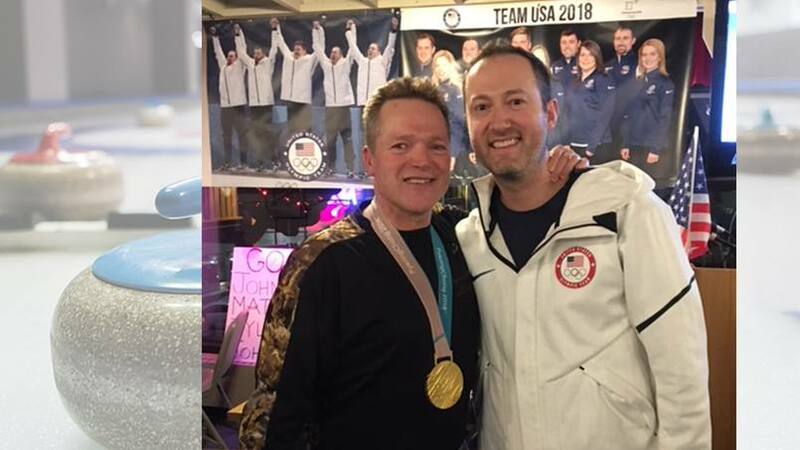 Among the many fans cheering on the USA men's Olympic curling team was Gold Cross operations manager Dave Johnson, a fellow member of the Duluth Curling Club, home of the gold medalists. When Dave Johnson steps onto the ice at the Duluth Curling Club this week, one of his opponents will have a slight advantage (and bragging rights) even before the stone throwing begins: an Olympic gold medal. "We play Shuster's team," Johnson says, then deadpans, "We're not favored to win." That would be John Shuster, skip (team captain) of the U.S. men's Olympic curling team, whose unexpected rise to the top of the podium in Pyeongchang has been dubbed the "Miracurl on Ice." Shuster and three of his Olympic teammates, Tyler George, John Landsteiner and Joe Polo, also are members of the Duluth Curling Club, where Johnson, an operations manager for Gold Cross, part of Mayo Clinic Medical Transport in Duluth, takes the ice and curls once or twice each week. Johnson tells us it was thrilling to watch his club mates advance through match after match, eventually winning the gold against Sweden. "I'm a big Vikings fan, a big Wild fan, and these men winning the gold was a bigger deal to me than if we'd won the Super Bowl or Stanley cup," Johnson says. "We're going to look at them differently forever." The team's gold-medal performance was both an upset and a comeback story. Shuster, who competed in three previous Olympics, "had essentially been fired by his sport's national governing body," The Washington Post reports. So he assembled his own team — dubbed "Team Rejects" — that started winning. And how. The team — "practically an afterthought in this event," according to USA Today — "won one of the unlikeliest gold medals in Winter Games history … knocking off powerhouse Sweden 10-7." The Hollywood ending has captured the attention of, well, Hollywood. There have been calls for a movie (with Nick Offerman as the mustachioed Matt Hamilton, naturally). The team will meet with producers during an upcoming West Coast media tour, according to USA Today. They've already hit the East Coast, "where they rang the opening bell at the New York Stock Exchange … appeared on 'The Tonight Show Starring Jimmy Fallon' … [and] participated in a ceremonial puck drop for an NHL game," reports the Journal Sentinel. They've picked up some famous fans along the way, including Mr. T, who frequently tweeted his support throughout the games. It's all heady stuff for a group of guys who are "really as humble as you can be," Johnson tells us. He says Shuster and company have spent hours and hours meeting with fans and friends back home in Duluth, taking pictures, signing autographs and letting people experience the feel of a gold medal around their necks. "The medals are for everyone," Tyler George tweeted to a fan, "we're just the ones who take them home." It's that attitude that reminds Johnson of another team: his Mayo Clinic colleagues. "These guys share a lot of the Mayo values," he says. "They're about community, they're about support. It's never, 'Look what I did,' but always, 'Look what we did.' I loved these guys before they won, and I love them even more now. The shine hasn't worn off the medals or the guys." Go for the gold and leave a comment below before using the social media tools atop this page to share this story with others. This is awesome, congratulations on such an awesome run for gold!